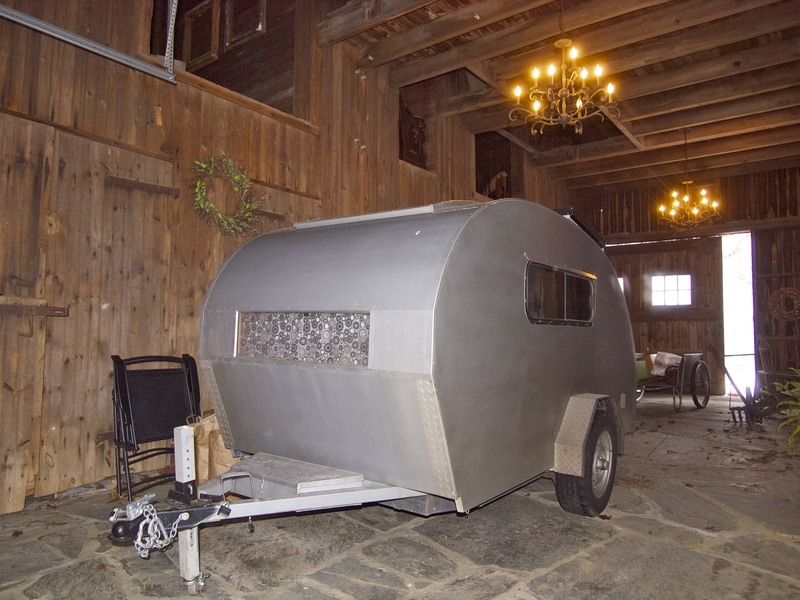 Since leaving Vermont, my Teardrop has been riding out the winter in my parents’ barn in Pennsylvania. I miss it! This week, while I’ve been home, I’ve been working on it, getting “the Rattler” ready to set sail in March. One project I’ve been scheming for awhile: a wood floor! I want to keep the Teardrop as light as possible, so as not to tax my trusty “Raven” too much (empty it weighs about 600 pounds, well under my Subaru’s 2,000-pound tow capacity), so I went shopping at Home Depot for some lightweight wood laminate flooring. I found tiles made to look like parquet flooring for 89 cents each. 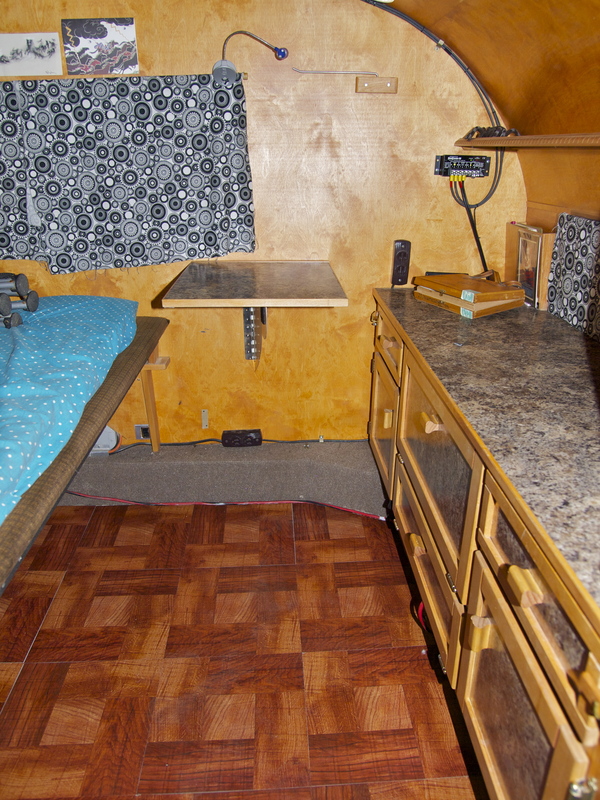 The Teardrop’s floor is 4 feet by 4 feet, so I was able to install my fancy parquet wood floor for $16! Score. So classy. Makes me want to have a dance party! 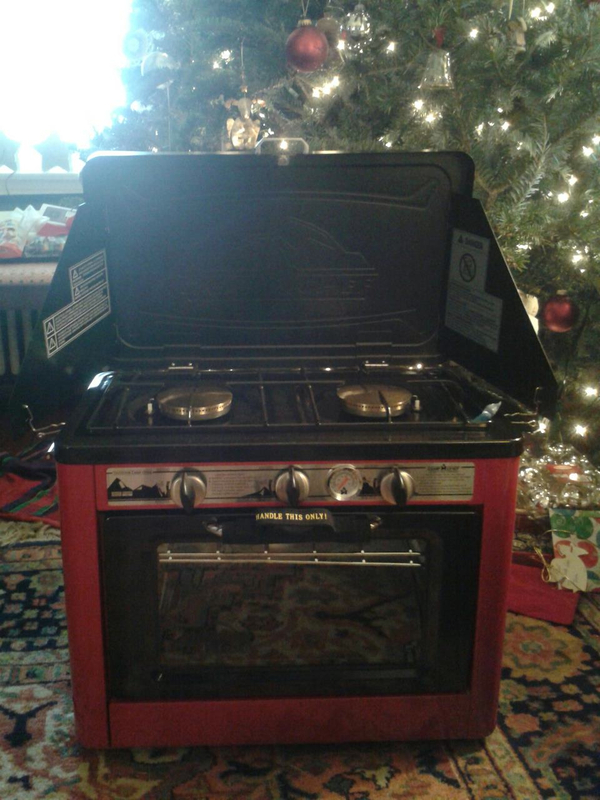 The other upgrade is courtesy of my dear mother, who gave me something for Christmas I’ve never ever heard of: a propane camp oven! This little Camp Chef range and oven runs on those little green propane canisters. Now I can bake cakes in my Teardrop! Camp Chef Oven and Range! Next time I swing through Nebraska to visit Egon, my Teardrop’s mastermind, we’ll see about redesigning to the kitchen to incorporate the new oven. I think I’ll have to pull it out and set it on the ground to use it — it gets hot on the outside and I don’t want a fire hazard in the Teardrop! But it would be nice to be able to store it in the kitchen area. For now, it slides neatly under the bed. My current kitchen set up. More counter space than I’ve had in some apartments! What route will I be taking to New Mexico? I have no idea yet! Check out my previous post: How To Plan A Killer Road Trip! 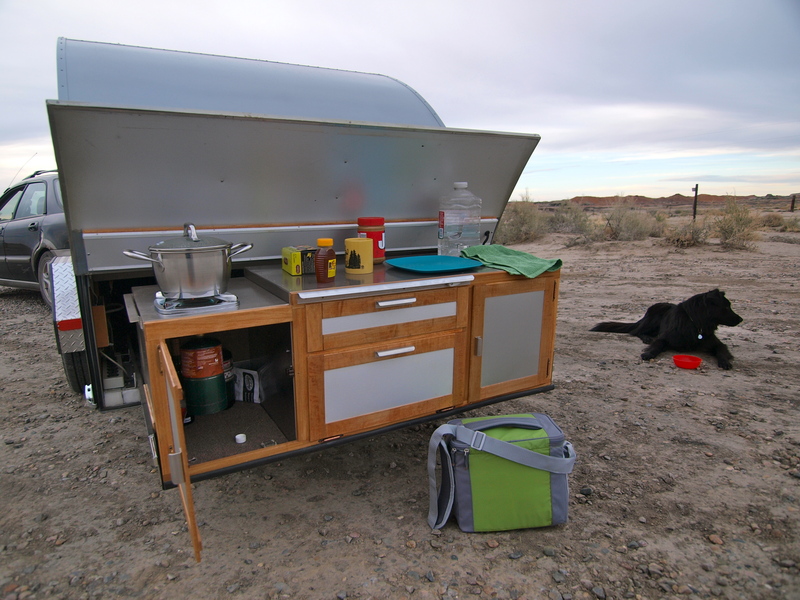 This entry was posted in Photography, Road tripping!, Sustainable Living, Teardrop Trailer, Uncategorized, Vagabonding 101. Bookmark the permalink. 27 Responses to Teardrop Upgrades! Hello! A great big thanks to you and Bob Wells of Cheaper RV Living, I’ve been inspired to be a full timer living in a 2001 Ford E350 called the Green Queen. I too will be heading for the Southwest in March with my dog, Rochelle. I’m going to be heading to AZ in March to hang with some vandwellers for a while. It would be so neat to cross paths with you, as you’ve been a great inspiration to live a more adventurous life. 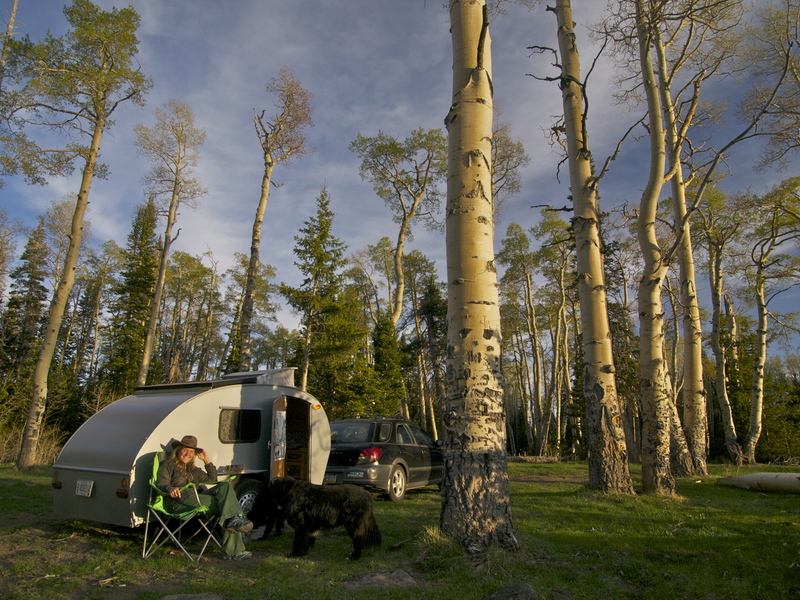 The vandwellers have a great niche on frugal boondocking, so, I’m really excited to live a lifestyle I always thought was for the wealthy. same as above, I am in Nederland, Colorado. I would offer you a free place to park, or guide you to the best kept secret places. DREAMY!!!!!! YOU LIVE IT TO THE FULLEST!!!! I LOVE IT! Love your idea about the tile on the floor of the teardrop. Lightweight and very attractive. I’d like to look into that for the Pony, as the carpet is really hard to keep clean, even when we wipe our feet at the door. Would love to hook up with you when you reach New Mexico! Hello from the Hoosier state. I have really enjoyed reading your posts. We are in the process of renovating a 1968 Trotwood camper. It has been a ton of work but SO worth it and SO much fun. You may already know this, we have found a refill kit (for only around $15) that allows you to refill the little green canisters from a larger 20 lb propane tank (like the standard gas grill size). It’s a much more cost effective way to use propane plus less waste. Hope this helps. Safe travels! Where did you find the refill kit? Sounds like exactly what I am looking for. You can find the kit at stores like Gander Mountain, Bass Pro Shop, or REI. You can also grab a cheap key for the little green canisters. The key allows all the fuel to be released from the canister so it can then be recycled. I am so jealous – New Mexico is my favorite place in the entire world …. every part of New Mexico. I love Taos and Cloudcroft and every place inbetween. Enjoy! Don’t be jealous, be inspired! Start planning a trip! The makeover to your delightful teardrop Mary looks really cosy.Those parquete floor tiles are excellent, they give a nice golden glow as I remember and love the stove.Brings back memories for us.We used to travel around England weekends with our caravan loaded with Original roman recipe sauces we produced. We were Re enactors selling our wares. Enjoy all your posts,they are always ! and I mean always exciting. Take care on your travels. Thanks, Rita! I may hit you up for some UK travel tips this fall. I’m planning on a month in Ireland and Scotland! Nice looking floor, I see a second calling for you in the future. In my 9 years of travel, this is only the second oven like this is have seen, and the first was only 2 weeks ago, and the couple loved their little oven and said it gave good results (they were making cookies when I met them). BTW, they were also travelling in a teardrop, albeit a little larger one (the r-Pod). Happy travels!! Wow, your parents’ barn is gorgeous. Chandeliers and stone floors. Yes, please!